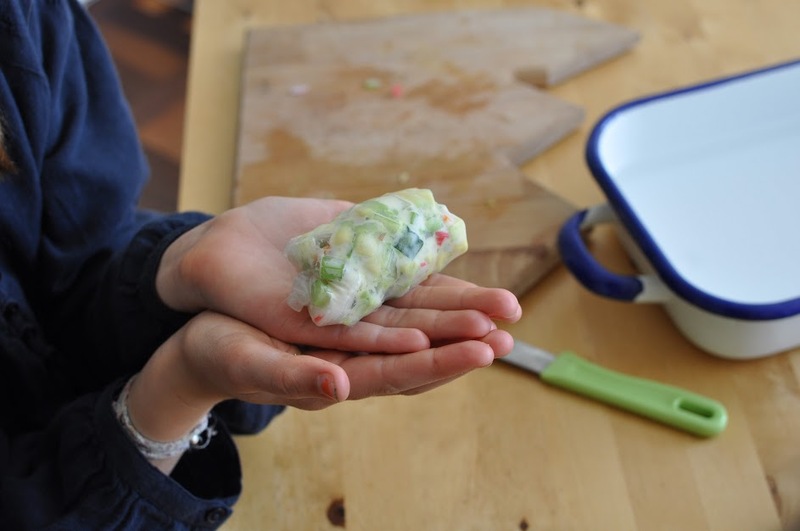 My kids and I are really into making rice paper rolls these days — a very fun and healthy cooking activity, which they love! Dried rice paper is available from the Japanese store (you get about one hundred sheets for a few euros). The fillings can vary — we’ve tried cucumber, carrot, avocado, celery and crab sticks. Other good filling are: red pepper, prawns, tofu, bean sprouts, spring onion, Chinese cabbage, egg omelette, fresh herbs (coriander, mint) and chicken strips. They can be completely veggie or kosher, depending on the fillings you choose, and are gluten free! Place the fillings in little bowls on the table, together with a bit of (Japanese) mayonnaise. 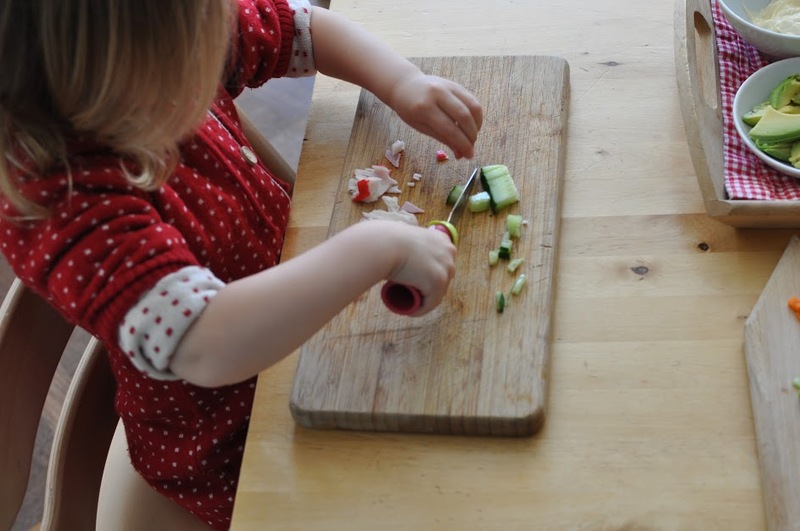 My kids love cutting veggies (and are pretty good at it!) so I slice them in fairly big chunks and let them do the rest. Soak a sheet of rice paper into a bowl of lukewarm water until it’s soft, about 15 seconds, and place on the table. Spread a little bit of mayonnaise onto the paper, and choose the topping you like to use. Fold over sides of paper and roll up to close. Done! You can make a quick dip sauce (combine rice vinegar, lime juice, sping onion and a bit of fish sauce, minced red chilli, mint and coriander) or serve with sweet chili sauce. My kids absolutely love these too! I find they eat just about anything that they’ve had a hand in making themselves. We also add rice vermicelli noodles to fill them out a bit, making them quite a substantial meal. 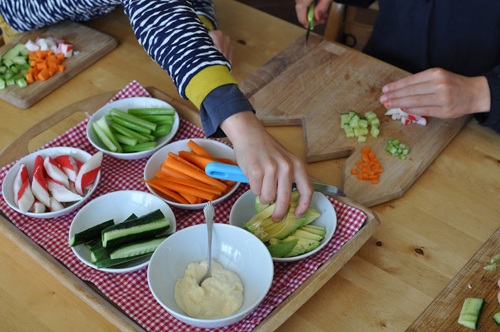 Looks great, curious to know what kind of knives your kids are using in the pictures? Looks fantastic Esther! This is going to be the first activity for the summer holidays now, thanks!! 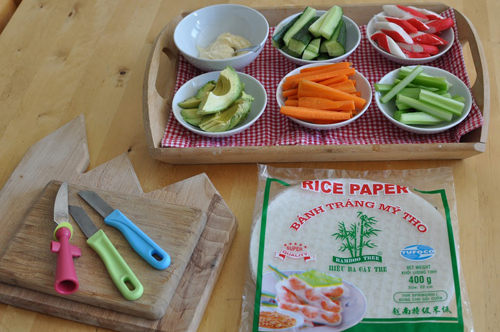 We love making rice paper rolls too…..and if you like the taste of the vietnamese mint it is good to know that it is so easy to grow! Our children are learning to like it, we love it! Simply buy ‘cut’ vietnamese mint from your local asian shop (yes! even out of the fridge), stand it in a tall glass of water on the window sill, once a healthy root system starts shooting out of the cuttings (after about a week) plant in a pot with soil. Vietnamese mint loves water, never allow it to go thirsty – best planted in a large non-draining pot because once it gets going it grows and grows! New shoots steadily fill the pot and you will have a constant and instant supply of V’mint for the rest of the frost free months. Esther, not all of them will ‘root’ but you just need a good few to get started. I think I have worked out that the fresher the bunch of v’mint, is the more likely they are grow roots and so be pot-able. Good luck. Amazing Esther! Thank you for sharing nice beautiful dish. But do you know from where I can get this Rice Sheets in Amsterdam? I would like to try same dish too. Thank you in advance .